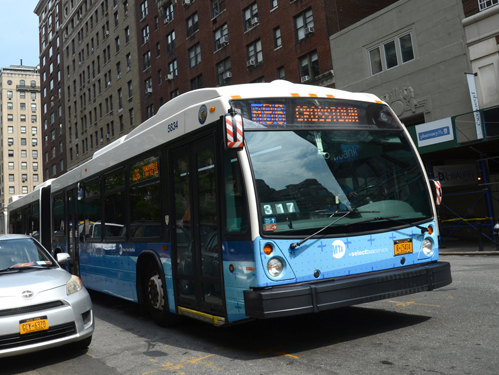 The M86 Select Bus Service runs along 86th Street and York Avenue and carries over 24,000 passengers per day, making it the second busiest crosstown bus and the most used per bus per mile in New York City. The M86 SBS connects 12 bus routes including the M15SBS, M101, and M4, and crucial connections to the 1, 4, 5, 6, B, and C trains. 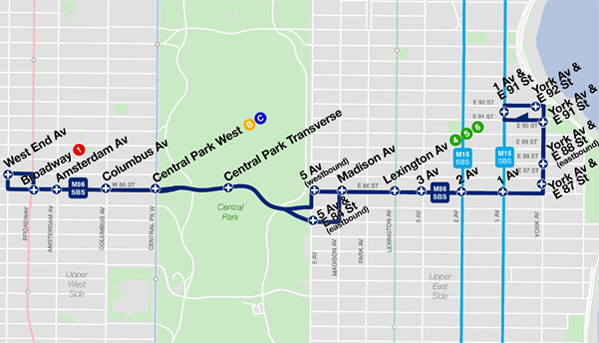 The M86 Select Bus Service replaces the M86 Local, but maintains the same stops, except Second Avenue, which is temporarily closed due to Second Avenue Subway Construction. To make bus boarding a more comfortable and efficient experience at 86th Street and Lexington Avenue NYCDOT, in partnership with the Department of Design and Construction (DDC), is building bus bulbs which will extend the sidewalk and bring the curb to the bus. Expected completion is in 2016. Look here for updates. Community outreach for this project will include a series of presentations and meetings with community boards, residents, and stakeholders to identify issues, discuss options, and gain feedback on the project. NYCDOT and the MTA released an evaluation report for the project in May 2017. The report shows growth in ridership by 7%, improvements in bus travel times of up to 11%, and a 96% customer satisfaction rating. Community boards are local representative bodies. There are 59 boards across the City. DOT and MTA make presentations to all of the Community Boards located along proposed Select Bus Service routes.